We devised this activity to go one step further in our knowledge of suffixes when using word searches. Rather than give the children the suffixes to find - as in a normal a normal word search, we wanted the focus to be on the meaning of the suffixes. 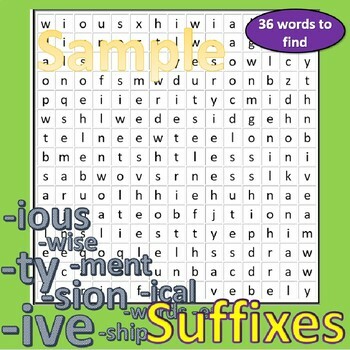 Therefore, when completing this activity, the children receive a grid of 36 meanings and have to use their growing knowledge of suffixes to find the 36 suffix elements within the word search. The answers to the clues will lead the children to finding the words in the word search. This activity has proven to be very successful to reinforce learning, revise and embed suffixes, particularly in time for assessment on vocabulary. 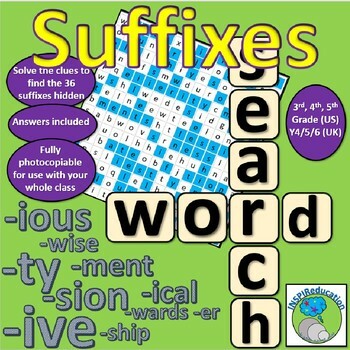 The uses for this activity are immense - the one thing in common - it has made reviewing and embedding suffix knowledge fun for the children, with a slight competitive edge. Ideal for 4th and 5th graders who are focusing on their knowledge of language forms.